Silver Creek Pathway has been a gradual work in progress, an evolving trail that is now considered well worth the wait by visitors to this corner of Lake County. What began as a short path for campers in the 1970s is now a 4-mile loop that extends between two state forest campgrounds and follows both sides of the scenic Pine River. 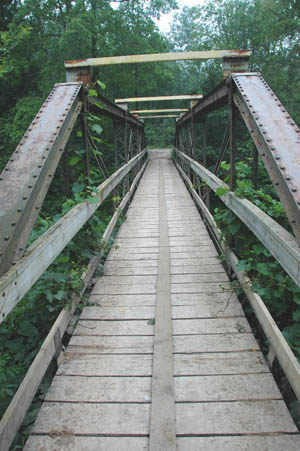 The key to the trail’s development was the installation of a pair of bridges that allow hikers and others to cross the river and return to the trailhead. The first arrived in 1985 when the Department of Natural Resources purchased what was then the Baxter Bridge, a one-lane, iron-trestle structure the Michigan Department of Transportation was replacing across the Manistee River. The 80-foot-long bridge was moved south to the Pine River and renamed the Lincoln Bridge. Snowmobilers rejoiced immediately, using it as a link between the Cadillac-area trails and the Lincoln Hills Trail system. 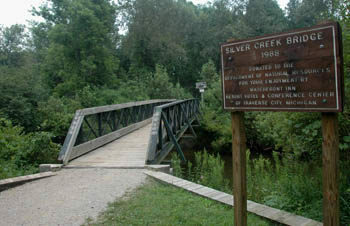 In 1988, the DNR used a donated bridge to span the Pine a second time, this one at Silver Creek State Forest Campground. With the bridges in place, the pathway was then extended, first north along the east bank of the Pine to Lincoln Hills State Forest Campground and then several years later along the west bank back to Silver Creek Bridge. The result is a delightful loop that skirts both sides of the Pine. 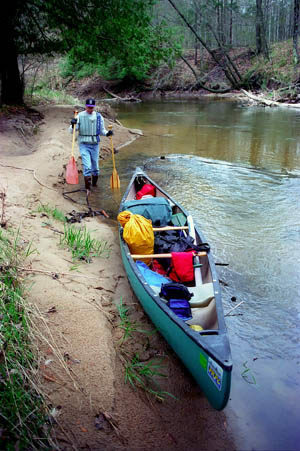 The blue-ribbon trout stream winds 3.5 miles between the two campgrounds and is considered by paddlers as the fastest river in the Lower Peninsula. In the summer, hikers skirt high bluffs, watching anglers fishing in the morning and evening and canoers and kayakers bobbing through the swift current in between. At one point along the west side, you are within view of the Pine for almost a mile, making the Silver Creek Pathway one of the finest river trails in Michigan. 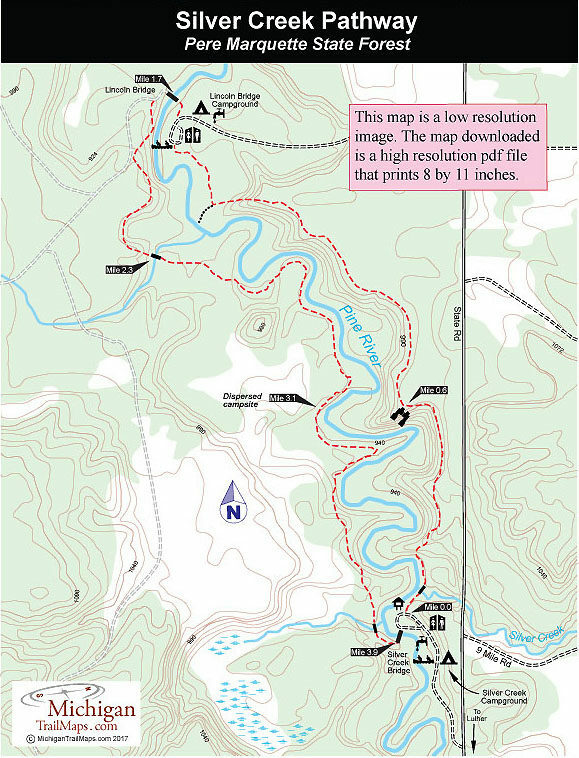 The main trailhead is located in Silver Creek State Forest Campground, an excellent place for a weekend stay to hike and fish for rainbow trout. The more adventurous can bring a backpack and follow the west side of the loop to a handful of great spots for a backcountry campsite overlooking the river. The trail is open to hikers and mountain bikers. At the north end the pathway comes close to the Lincoln Hills ATV Trail, a 35-mile system that also utilizes the Lincoln Bridge, making the Lincoln Bridge Campground a popular base camp for ORVers. But overall the motorized activity is kept at bay and the groups are well separated. One trailhead for the pathway in Silver Creek State Forest Campground is located next to site No. 10 and is well posted with a display map. Heading north you immediately arrive at the confluence of the Silver Creek with the Pine River, a deep hole that’s accented with a thick rope swing over it. If the day’s hot, there’s no better way to end this trek than by taking a turn on the rope swing. Eeeha! The trail uses foot bridges to cross Silver Creek and then a smaller stream before climbing a steep river bank to its first edge-of-the-bluff view of the Pine. Continuing along the bank, you pass a spur at Mile 0.3 that heads east (right), the start of a short loop that is poorly marked and hard to follow. Stay on the main trail to skirt the bluff to a great overlook at Mile 0.6. The view includes two bends in the river, any anglers casting for trout and a ridge several miles away. In the next mile you dip twice onto an ORV trail and then make a rapid descent to a “T” junction. Head right to break out at the Lincoln Bridge Canoe Landing at Mile 1.6. There are toilets, water, campsites and picnic tables either at the launch site or the nearby State Forest campground. Also nearby is the Lincoln Bridge. This classic trestle bridge is set in a wooded ravine and from the middle you can view the Pine upstream and downstream or look below for trout. On the other side is a two-track that is posted as the Irons Snowmobile Trail, an ORV trail and the hiking trail. Truly a multi-use trail. Within 100 yards the pathway veers south (left) away from the two-track to enter the woods and leave the other motorized trails behind. The west side of the loop features fewer bluffs and less climbing. After swinging away from the river and intersecting a pair of two tracks, you descend to a foot bridge across a small stream at Mile 2.3. Within a third of a mile from the bridge you return to the banks of the Pine and begin the highlight of the loop. For almost a mile the pathway skirts the river, sometimes right along it, other times just above it. The water is so clear and the current so swift that you can see trout facing upstream, waiting for some morsel of nourishment. 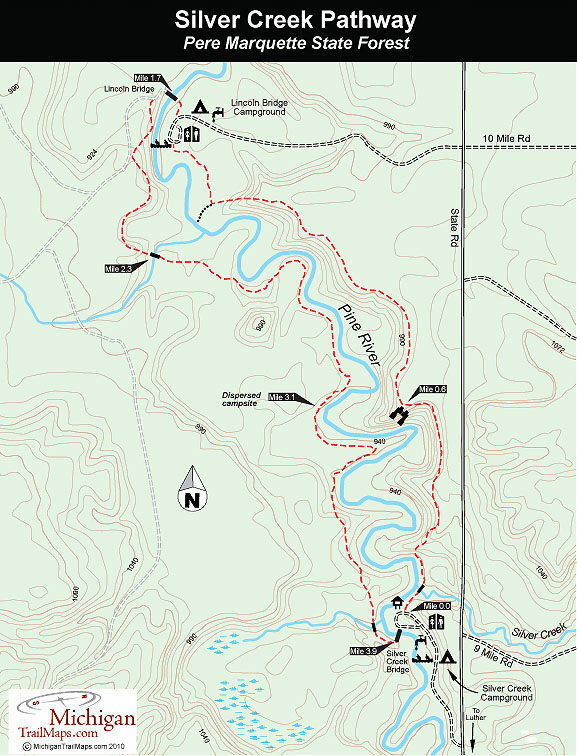 At Mile 3.1, or less than a mile from the Silver Creek Bridge, is an ideal place to set up a dispersed campsite, a place where you can pitch your tent in a grove of large cedars overlooking the river. In another quarter mile the trail takes a sharp turn to the west (right) along with the river, climbs the river bluff and then skirts the bluff for a short distance. Keep a sharp eye for trail markers at Mile 3.7 where the pathway crosses an old two-track in a red pine plantation as this area can be confusing. Shortly after that another foot bridge over a feeder stream is crossed and the Pine with the Silver Creek Bridge pops into in view. Silver Creek State Forest Campground has 26 sites with more than half of them either on the river or only a short walk away. There is small picnic area and a handful of walk-in sites designed for canoers on overnight trips. At the north end of the pathway is Lincoln Bridge State Forest Campground with 9 sites and a canoe landing area. There are no vehicle entry fees but there is a nightly camping fee at Silver Creek and Lincoln Bridge State Forest Campgrounds. Silver Creek State Forest Campground is reached from US-131 by exiting onto Luther Highway and heading west for Luther, the small town on the banks of the Little Manistee River. At Luther head north on State Road for 5.5 miles and look for the posted entrance of the campground. The DNR Cadillac office (231-775-9727) is located just north of town on M-37 and is open 8 a.m. to 4:30 p.m. Monday through Friday. Maps can be picked up at information display outside after hours.